Manuscripts should be written in simple form and prepared according to the guidelines given here. Main text should be prepared in a standard PC-compatible word processing program (Microsoft Word). No page limit is applied for submissions of original research articles, reviews, short communications, technical reports and letter to the editor. However, number of words in manuscript should be lower than 10000. Manuscripts should be typed in Cambria font, 9.5 pt. Manuscripts content should be formed in this order: Title, authors’ titles, affiliations, abstract, keywords, main text (i.e: introduction, theory, results and discussion, conclusion), acknowledgement, references, figures and tables. The gap between section titles and paragraphs, and the gap between manuscript paragraphs should be 6 nk while it should be 9,5 nk before the new section title. But, there should not be gap between lines in a paragraph. Standard page size is B5 (17.6 cm x 25 cm). Page margins should be adjusted as 2.1 cm from the top, right and bottom sides, and 2.7 cm from the left side. Title page should consist of article title, authors’ title and affiliations. Aricle title must be typed in Cambria font, 12 pt, authors’ titles should be typed in Cambria font, 10 pt, and affiliations must be typed in Cambria font, 8 pt. If subtitles are necessary, Journal suggests using subtitles with 2 stages at most. The abstract should briefly and clearly summarize main theme, aims, and contributions of the paper. Abstracts of submissions are limited to 50 words at least and 250 words at most. In title and abstract, authors should avoid to use newly or recently defined abbreviations that are unknown by most of relevant researchers. Minimum 3 and maximum 6 keywords should be separated by semicolons. Keywords should supply the best identification for the content of the manuscript. Authors should avoid to use multiple words as one keyword. All photographs, graphs, charts and diagrams should be referred to as figures that are numbered sequentially. Proper position of each figure should be indicated in the manuscript and each figure should be referred in text. Figures can be located into proper places in the manuscript or in separate pages at the end of the submission. Captions of figures should be listed in a separate page after the reference list. Figure captions should briefly state the figure content. Figure captions should be numbered according to appearance order in text and located to down-center of figures. Pictures, illustrations and photographs should be submitted in one of TIFF, JPEG or PNG formats. They should have adequate resolution to show required details that should be easily perceived by readers. Authors must ask permission for use to the copyright owners of formerly used illustrations. Tables can be located into proper places in the manuscript or in separate pages at the end of the submission. One table should fit in one page when it is located to proper place in manuscript. Each table should be given with a brief and self-explanatory caption. Table captions should be numbered according to appearance order in text and located to top-left of the table. A list of captions for the tables should be given in a separate page after the page of figure captions. The journal prefers using SI units rather than to use British system, but British system can also be accepted. Mathematical expressions should be written in equation editor of Word program with the point size, 9.5. Indices font can be between 6 and 8 point sizes. Each formulation in text should be centered in separate line and numbered in parenthesis ( ) at the end of the line. As an easy way, it is necessary to use invisible 1x2 tables to locate formulations and relevant numbers. All symbols in formulations should be explained in related part of text. A list of symbols can also be given if it is necessary. Capitals and lower case letters are used for denoting different parameters. All symbols should be typed using italic font. But, normal font should be used for mathematical numbers, sub-scripts, and super-scripts. References should be given according to the numbered (Vancouver) system. References should be quoted in text by Arabic numbers in square brackets and numerically listed at the end of the article according to the order of referring in the manuscript. Author surname first name initial(s). Title of the article. Title of the journal, year; volume(issue): page interval. 1. Ahmed N, Natarajan T and Rao KR. Discrete cosine transform, IEEE Transactions on Computers, 1974;23(1):90 – 93. Author surname first name initial(s). Title of book. Edition number (if it is not first edition). place of publication: publisher; publishing year. 2. Timoshenko SP. Vibration problems in engineering. 2nd edition. New York: D. Van Nostrand Company; 1937. Author surname first name initial(s). Title of the thesis, thesis type (MSc. or Ph.D), institute submitted, place, country, year. 3. Fletcher SG. The tempering of plain carbon steels, PhD Thesis, Massachusetts Institute of Technology, Massachusetts, USA, 1943. Author surname first name initial(s). Title of the presentation. In: surname first name initials of editors. Title of proceeding book: name of conference; date of conference; place of conference. Place of publication: publisher; proceeding book publication year. p. page interval. 4. Kandemir-Mazanoglu EC and Mazanoglu K. Parametric study on implementation of viscous dampers for adjacent buildings. In: Awrejcewicz J, Kazmierczak M, Mrozowski J and Olejnik P. Dynamical Systems: Mechatronics and Life Sciences: 13th International Conference on Dynamical Systems: Theory and Applications (DSTA 2015); 2015 Dec 6-10; Polland. Lodz: ARSA druk i Reklama; 2015. p. 313-322. Author surname first name initial(s). Title of chapter. In: Editor Surname first name initial(s). Title of edited book. Edition number (if it is not first edition). Place of publication: Publisher’s name; year of publication. p. Page interval of chapter. 5. Gillich GR, Praisach ZI, Hamat C, Gillich N and Ntakpe JL. Crack localization in L-shaped frames. In: Herisanu N and Marinca V. Acoustics and Vibration of Mechanical Structures – AVMS-2017. Berlin: Springer; 2018. p. 315-322. Author surname first name initial(s)( Remove authors if they are not seen). Document title. Webpage name [Document or homepage or blog on the Internet]. Source/production information; Year of internet publication [cited year month day]. Available from: URL. 6. Mazanoğlu K, Kılıç E, Merter O and Yılmaz F (Remove authors if they are not seen). Author Guidelines. 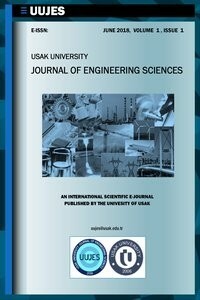 Usak University Journal of Engineering Sciences [Document on the Internet]. Dergipark/Usak University; 2018 [cited 2018 July 5]. Available from: http://dergipark.gov.tr/uujes/writing-rules. Euler–Bernoulli beam theory  states fundamental expression for continuous vibration analyses of thin beams. Fourier analysis methods have been used for decades to obtain structural damages [2-5]. Recently, wavelet based analyses have become more popular through researchers who study on vibration based condition monitoring techniques [2,4,6-8]. If, on the other hand, authors’ surnames of references are needed to be quoted in text, relevant reference numbers should be in brackets located just after surnames. Following examples are given for these cases. For the reference with single author: Mazanoglu  presents ……. For the reference with two authors: Mazanoglu and Sabuncu  introduce ……. For the reference with three or more authors: Yesilyurt et al. state ……. Corresponding authors of accepted papers receive uncorrected page proofs for final check before the publication. They should return with approval (if there is no correction) or correction remarks as soon as possible.